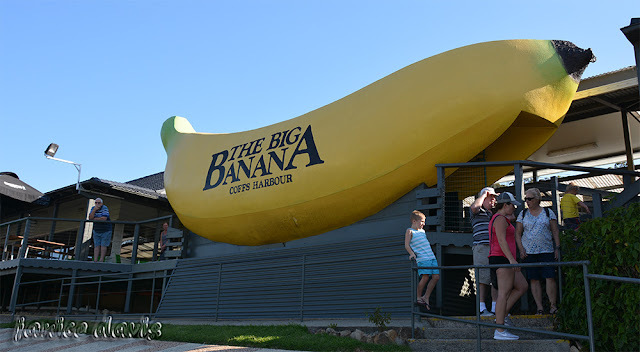 The Big Banana at Coffs Harbour a busy place with an eatery with all things tasting banana flavour. Ice skating rink, mini golf and a few other entertaining things to do and see. We arrived late in the day so therefore wasn't so busy as they were getting ready to close. Many children were taking turns sitting of the mouses knee. I didn't know there was a gift shop and cafe there, although thinking about it, why wouldn't there be? Did you eat in the cafe? I'm curious about the "all things banana flavour"
We do have a lot of 'big' things don't we? Banana, pineapple, merino, potato, guitar and rather a lot more which escape me at the moment. We certainly do have many big things in Australia - guitar, parrot at Kimba, mango, prawns, crabs to add to your list there. I love this banana and monkey and mouse.... This place must be wonderful cafe and shop. 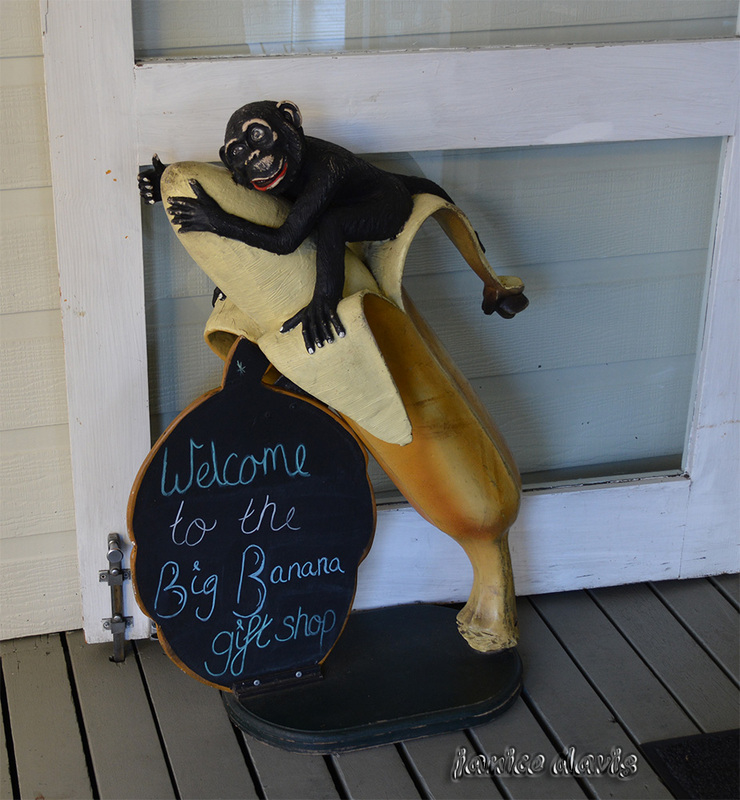 Spent sometime in the gift shop, all kinds of banana related objects. I wonder which came first, the banana or the pineapple. Well that's a good one Andrew. On October 1971 the big pineapple was opened. 22 December 1964 for the big banana, according to Wikipedia. Such a beautiful place !! I would sit on this bench with a mouse! Happy Sunday, dear friend ! Lots to do there for the young ones Mildred. This is funny!! Great pictures. :) Marco, our 'big' things are amusing if never seen or heard of before. 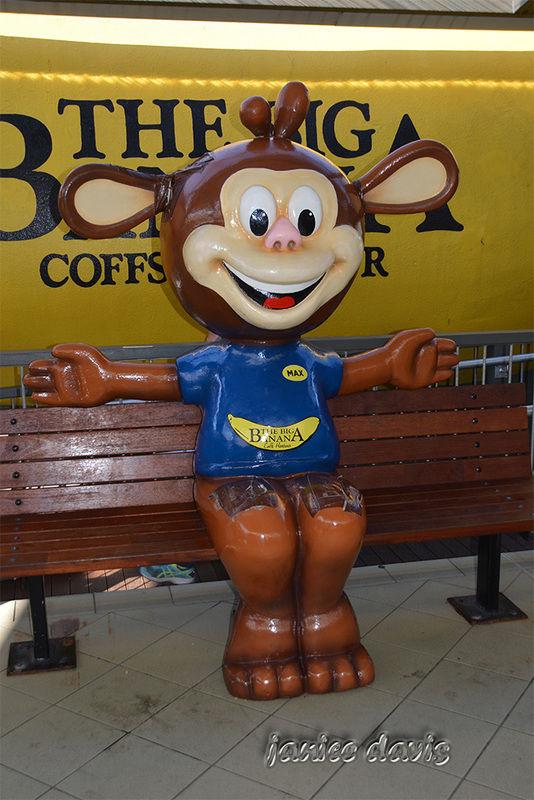 I am very fond of a banana and wonder what banana flavoured things they sold - cakes! icecream! perhaps. A link to the big banana Rosemary - there you will find a menu. wow big banana shop sounds interesting. What did you buy there? Having a good day at home, thanks Sandra. Good place, for kids to enjoy. Oh that is for sure. Well you might get there Jo-Anne. I was waiting for your Big Banana picture - no post on Coffs Harbour would be complete without one. Thought you would be waiting :) I didn't disappoint. The monkey reminds me of what's going on in the White House these days. --- and that REALLY is a big banana! The Big Banana has aged not too bad. So many of the "big" things have fallen out of favour. Some have and some have been repaired or replaced when necessary. It's good to see most of them doing rather well as we travel. We do indeed Lee all over Australia.